The most exciting and novel pre-School game of all times, that helps your kid enhance his knowledge of things in a very interactive way. Attraction to kids is the basic concept behind Monkey Temple Surfer.. Ready to run and jump in the forest to boost up your energy with delicious and mouth-watering food stuff of different shapes to captivate kids attention. Get rid of the subway rail and come conquer the jungle and be the best monkey running surfers jump in saga history. 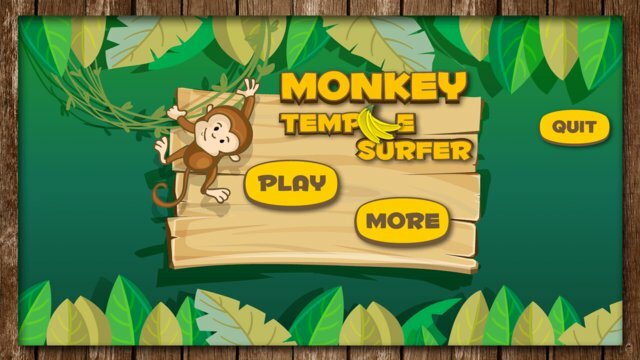 Help the starving monkey eat his food, by jumping into the Monkey Temple Surfer. This 2D smooth tapping platform provides you with an interesting gameplay and dynamic physics. The starving monkey will run jump and collect coins through picturesque levels, each with its own unique design. Moreover, he'll get a chance to buy extra lives and stay longer in the game. So, don't be late. rush to install. These featured landscapes provide you and your kid a height of interest level, jump, run, do jungle adventure to make your monkey feel better. These actions attract people from all ages. Plenty of food items come when you progress to the new level. 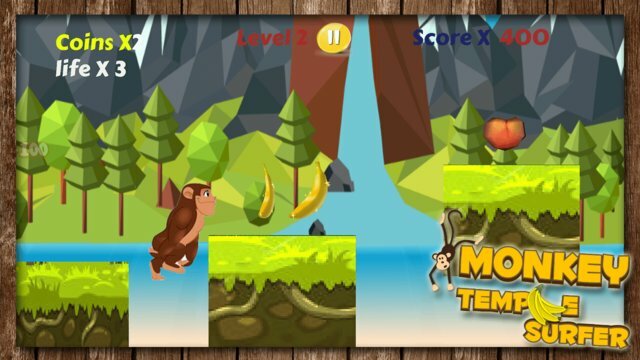 Monkey Temple Surfer comes with 9 levels each with a beautiful landscape and mouthwatering food and fruits.